- Teams are formed based on school/neighborhood and coach requests. 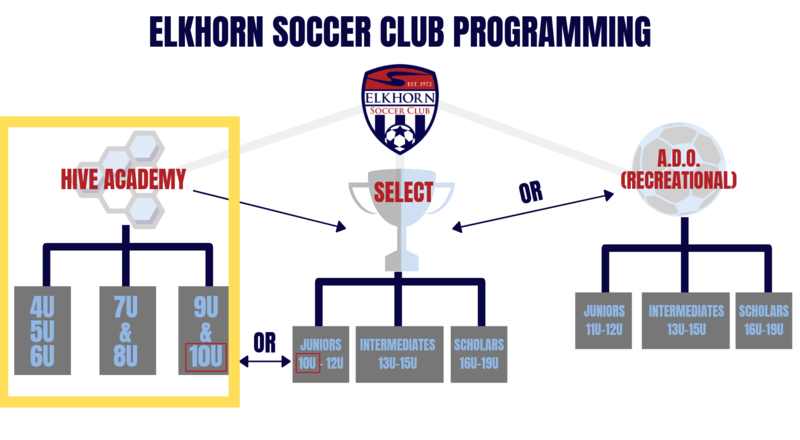 The Elkhorn Soccer Club strives to honor all coach and teammate requests; however, due to roster size limits, we are unable to guarantee all requests will be honored. - 7U-8U teams train one time per week under the supervision of the Age Group Director, professional club staff and parent coaches. 9U and 10U teams train two times per week. - All teams play within The Hive in-house outdoor league and the 9U/10U age groups have the opportunity to participate in the ESC Hive Friendlies or Coerver® Cup in the fall. 9U/10U teams will play in the NSSA Spring Cup during the 2018 spring season. Hive+ is designed to provide a more challenging training environment for players who have consistently demonstrated exceptional talent and potential. Coaches and club directors will recommend players for Hive+ training. Selected players will participate in a minimum of four training sessions per season with top ESC coaches. There is no additional fee for Hive+ training.